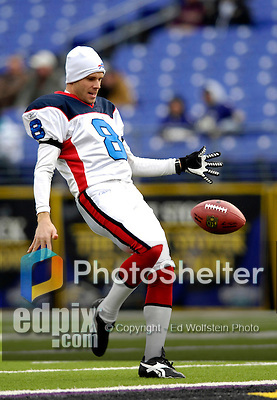 31 December 2006: Buffalo Bills punter Brian Moorman warms up prior to a game against the Baltimore Ravens at M&T Bank Stadium in Baltimore, Maryland. The Ravens defeated the Bills 19-7. Mandatory Photo Credit: Ed Wolfstein Photo.